Home ARA Blog What Does Asbestos Look Like? To the naked human eye, asbestos can look like almost anything; it is a highly versatile material that can be used as a component in a wide variety of products. This means asbestos can be found in fibre boards, tiles, concrete, drywall, shingles and even the insulation on a storage heater. It is entirely possible that you might have asbestos in your office or home and not even realise it. To make matters worse, fixtures and devices that contain asbestos often look like any ordinary object. During the 1980s asbestos was often mixed with plaster, cement and/or calcium silicate to create low-density fibre boards. These LBDs are extremely dangerous because if they crack or break, they emit plumes of dust that people and pets breathe in. This dust goes straight to the lungs where it can create many health problems, including a kind of cancer known as mesothelioma. What’s even more alarming is that these boards are very difficult to distinguish visually from ordinary construction sheeting. For this reason, we recommend that you consult with an A class asbestos removal specialist. As you can see from the picture above, the asbestos-infested ceiling looks like any other ceiling. Asbestos ceilings are particularly dangerous because of leaks. If the roof starts leaking, asbestos can literally start dripping down on the heads of those inside. To make matters worse, the asbestos will likely get into the air and people will start breathing it in. This often occurs when buildings start settling or when work is done. This can fill the air with clouds of asbestos dust. 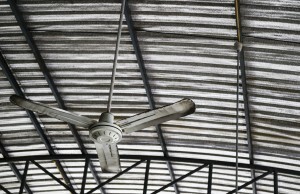 Many older ceilings are made of asbestos tile or asbestos cement. Asbestos cement was a common building material throughout the 20th Century, so, unfortunately, it is all over Australia. The danger from asbestos in walls is great because it can be present in many forms, including concrete, plaster, drywall, and metal. Some walls might also have asbestos insulation. As you can see from the picture above, there is no indication the wall panelling contains asbestos. This means you will have to have a professional inspect the walls to be 100% sure that it is asbestos free. All heating units installed before the 1980s may contain asbestos. These heaters sometimes contained asbestos blankets inside or pipes that were wrapped with insulation made from the hazardous material. This can present a serious hazard because the wrapping often becomes damaged with age. Forced air heaters can present a serious danger because they can blow asbestos particles all over the home. If your home, business or rental unit was built before the 1980s there is a good chance it contains asbestos. But the good news is - you can eliminate this threat by having a professional inspect your home.